As this most beautiful golden autumn enters its last phase before the onset of winter we are seeing some good water levels to encourage salmon and sea trout into the upper reaches of the South Esk and Prosen in preparation for spawning. It hasn’t been a great season from the angler’s viewpoint, but that doesn’t mean it has been a bad one for our migratory fish. Some of our visiting anglers have commented on the large number of parr in the river and this is also true of the Lemno Burn. I also saw a few parr in the Rottal Burn when I visited a couple of weeks ago, but nowhere near the high numbers lower down in the catchment. Indications of an abundance of invertebrates are apparent in the feasting watery wagtails and dippers as well as observed hatches of olives and sedges. Using these impressions rather than formal recordings I think the river is in good ply. If that is the case there is no reason why good numbers of smolts should not leave the river in the spring of 2014. In fact I think, again from unstructured and unscientific observation, that 2013 was not a year of high abundance for salmon or sea trout. Whether conservation levels of each component (population) of the river’s natural stock were met will probably never be known because no-one is counting them. As I said in an earlier blog, the catches by the four beats – Kinnaird, Finavon, Inshewan and Cortachy – in the period February to the end of May were considerably higher (30%+) than the ten year average. In my opinion the higher catch was the result of good fishing conditions rather than a greater head of fish in the river. I am absolutely certain for example that there were many more salmon in the South Esk in 2011, which was the yearthat Usan nets killed 2307 salmon in May. Photo taken by Colin Statter on the River Allan near Stirling. An autumn fish on its way to spawn. Alec and Anne Lyell fishing down the Flats (Milton Beat) in good October water. I look forward to visiting the Rottal Burn again in early December, where at that time there should be fish spawning. It will be interesting to see if any or most of those fish are multi sea winter salmon. Marine Scotland’s South Esk Tracking Project is designed to find out where the River’s early running salmon go within the South Esk catchment to breed. Following identification of spawning and juvenile habitats locations it is hoped that an assessment of the physical condition of the river in those places will lead to targeted improvements. To some extent at the end of year 2 (of 3) we can say that objective is being met, although sample numbers are very low. It is no surprise to learn from the MS tracking project that Usan nets are killing spring salmon from many, if not all east coast rivers. With proof that the Spey is also impacted by the activities of the Montrose-based nets it is now established that the Rivers Spey, Don, Dee, North Esk, South Esk and Tay are affected. It is not unreasonable to assume that the Earn, Deveron, Ythan, Uigie and Findhorn may also be included in the list, not to mention the smaller rivers – The Rivers in Between – such as rivers Bervie, Cowie, Lunan, Eden, about which I wrote recently. All our east coast rivers are affected. In other words, all the main North East salmon rivers – the jewels in the crown of Scottish wild spring salmon – are being damaged by the activities of one small operation near Montrose. That is a high price to pay for the part-time jobs of a small family business. It is not fanciful to claim that Usan Fisheries Ltd is holding the survival of our national reserve of these iconic spring fish to ransom, apparently supported by our government. Why? Disagreement on the Natural Capital value of wild salmon. Conflict between netting interests and fishery management. There has been a lot of talk over the years about the effects of exploitation of both Atlantic salmon and sea trout by the coastal nets at Montrose. Much of what has been said has been speculative and sometimes exaggerated, but no-one can deny that feelings on the subject have been running high on both sides of the debate. An early casualty of emotional arguments is truth, and the Usan nets issue is no exception. It is unfortunate that during their fishing season the nets have first crack at incoming salmon and sea trout migrations. Imagine a situation where nets and rods had equal and simultaneous access to the fish. In that scenario there’s not much doubt that agreement would have been reached long ago on how to share the ‘harvest’. Sadly it doesn’t work like that. 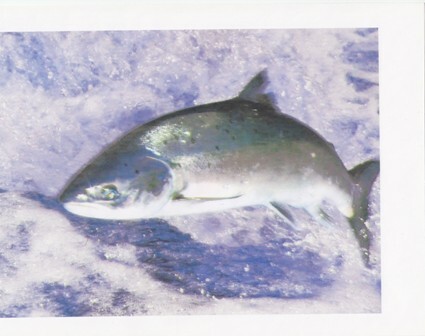 After their long migration salmon arrive off the Scottish east coast. Swimming close to the shore, many become enmeshed in Usan’s carefully sited coastal nets. These fish, so close to their destination, are survivors of about 95% marine mortality between their departure as smolts from fresh water to their return as adult fish. All netted fish are of course killed as they are brought into the boat. Those that avoid the nets might then enter their river of choice. Alternatively they might move on up or down the coast; or, especially if river levels are low and there is only a weak chemical signal inviting them into fresh water, they may just hang around close to estuaries, remaining vulnerable repeatedly to being netted. Before any fish can enter the river, they therefore have to run the gauntlet at least once as they are either caught in the nets, or bypass them. All this happens before a single angler has seen, let alone caught, even one fish. Perceptions among fishery managers and anglers are that they only see what the nets have failed to catch. It is the resulting sense of unfairness – crumbs from the laird’s table as it were – among people involved with rivers and fisheries that fuels the argument between nets and rods. Isn’t it an irony that those who defend the rights of the netsmen often do so on the grounds of wealth and class? That over-used argument tells us that salmon anglers are wealthy and privileged people – while the owners of netting interests feast sumptuously off profits from killing the survivors of returning migrations of salmon. The modern angler is more environmentally sensitive than anglers were even ten years ago. They are left to fish for what is left behind by the nets. Moreover, they mostly return their catches alive to the river (70%+). Meanwhile there has been no move towards quotas or increasing the nets slap times. On the contrary, weekend slap times are routinely ignored, more coastal netting stations are being reopened, more salmon killed, and financial incentives and support is offered by the Scottish Government and European Commission to the netsmen. Who benefits from the nets? Who benefits from the visiting angler? Where is the sense in all this? What is significant about the ‘mixed stocks’ aspect of the Usan net fishery? Salmon, and perhaps to a lesser extent sea trout, tend to be ‘loyal’ to their rivers of birth. I say “tend” only because there are many examples of salmon straying. How else could salmon in the River Mersey have re-colonised a river that was to all intents and purposes dead as a result of industrial pollution? There are also many examples of ‘hatchery stocking’ using ova or fry from other rivers, or of fish ‘going up the wrong river’, or changing their minds having entered one river only to go to another one to spawn. The ‘core stock’ of a river, with its unique DNA signature(s) is pretty robust, having withstood challenges from straying salmon from other rivers with different genetic make-ups for millennia. Unless the core stock is swamped, as has happened in rivers where farmed salmon in unprecedented numbers have interbred with the wild fish stock, the genetic integrity of the salmon ‘belonging’ to a river is likely to survive. Intermittent hatchery stocking or salmon straying naturally from other rivers are unlikely to damage the core stock. On the contrary, they may even strengthen in asimilar way to antibodies providing resistance to disease. Of course there are other examples, especially in USA and Canada, where huge dams have eradicated the stock, and the genetic signature of that river is gone forever. That is a tragedy because those genetics have evolved over centuries in response to the physical, geological, chemical and biological characteristics of the river. We must therefore make every effort to preserve the signature DNA of all our rivers where irreparable damage hasn’t already been done. We should recognise the value of natural biodiversity as the fruit of evolution in the context of every ecosystem. Therefore we shouldn’t be misled into thinking that the tendency of wild Atlantic salmon to stray to other rivers conflicts with the genetic predisposition of nearly every fish of a particular river to return to its waters to breed. Nothing is as jet black or marble white in the natural world. That genetic preference is part of the DNA makeup of wild Atlantic salmon. In situations, such the South Esk, where populations of fish within the overall stock of the river can we think be distinguished from each other by their genetic differences, together they define the structure of the river’s stock that has evolved since the last ice age. Scientists and managers are continuing to fill in the detail of genetic attribution maps. As things stand at present there is a varied picture of genetic description of stocks of wild Atlantic salmon and their populations, ranging from tributary specific attributions to broad-brush regional ones. Over time, like the detail of a landscape painting being added after the structure of the painting’s composition, the detail should describe with some accuracy which genetic groups of fish belong to which rivers. It is work in progress. The impossibility of effective fishery management. Our growing awareness of the importance of gene types should persuade us to take special care of rivers where we suspect that some populations, or even the whole stock, may be in a fragile condition. Fishery managers try to use the precautionary principle as a safety net to justify making timely interventions to protect threatened groups of fish. Unfortunately it is not possible to protect any population in any Scottish east coast river while mixed stocks coastal netting as practised by Usan Fisheries continues. The existence of an interceptive fishery that kills salmon indiscriminately from six identified rivers, and almost certainly many others, prevents effective management taking place in any of them. In a discussion with a government fishery scientist recently we agreed that the real worry in these times of low marine survival is that the stock of one of the smaller, less managed rivers such as the Bervie could be eradicated without anyone being aware of it. I asked him if he thought that is a serious concern, to which he replied that any reduction in biodiversity is very worrying. What does the word “sustainable” mean in this context? It is a situation apparently summarised by the politically motivated thought, “the rod fishery will have to be managed with the Usan fishery continuing its lethal exploitation of unknown stocks”. In fact it is impossible for fishery managers to take effective decisions to protect stocks while that mixed stocks fishery exists. You would have thought that, while genetic mapping continues to fill in the detail of populations attributable to rivers, at least a pause would be called on killing fish from stocks where there is a degree of concern that some populations may be fragile (or in technical parlance, ‘below conservation levels’). That pause should include both rods and nets i.e. no killing at all. If Catch and Release is shown to be politically unacceptable in terms of perceived equity and fairness, then both fisheries – rods and nets – should be closed. After all, the priority is to conserve the fish, not the people that exploit them! Philip McWalter’s 20lbs hen salmon caught in Harry’s Bar on 15 October and returned carefully to the River to spawn.Late Season Fishing at Finavon. Low water & coloured fish. As I write this blog on Saturday morning 19 October it is still raining after heavy rain overnight. The Armchair Boulder in the webcam view has disappeared beneath a muddy flood and the SEPA level marker tells me that at 0655 today at Gella Bridge the level was 3’2” and rising. It will certainly continue to do so well into the afternoon. 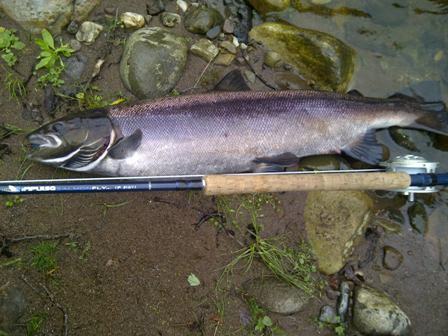 There has been only one place to catch salmon at Finavon this week. We have caught and returned four fish between 7lbs and 20lbs in the little stream known as Harry’s Bar (Bogardo Beat), just above the deep water at the head of Melgund Pool. Although there have been fish showing in the main pools, they have been reluctant to take, and all of those seen were coloured. In the previous week there were two fresh grilse caught, one of which was sea-liced. 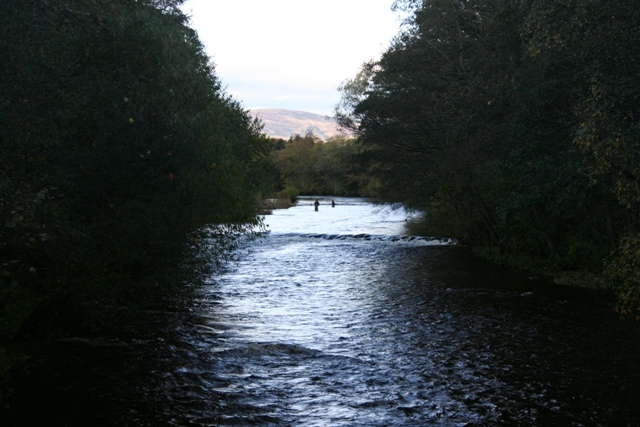 As we go into the last 10 days of the 2013 season I note that it has been a poor year for angling – the lowest catch of salmon and sea trout at FCW for more than 30 years. But it has not necessarily been a bad year for the fish. It will be interesting to see what the Usan nets declare and how many keep-ins there were during the season. Early spawning of sea trout took place and appears to have been successful in the Finavon spawning gravels in September, and there are plenty of salmon waiting to spawn when the water temperature drops decisively, probably next month and in December. In my view the river is in good ply and, given reasonable conditions over the next 8 weeks, there is no reason why the spawning period shouldn’t be productive. In that respect we are wholly in the hands of Nature.